For each issue of Literary Mama, Literary Reflections shares a writing prompt, inviting our readers to respond. Our editors provide feedback on the responses we receive, and we post our favorites on the blog. 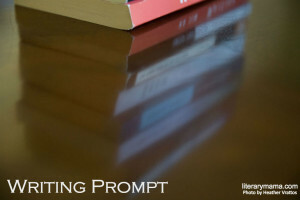 This month's writing prompt is inspired by Daniela Loose's essay Book Therapy. As her only daughter prepares to leave for college, Daniela Loose goes on a reading binge. Not just any reading binge, but one obsessed with books about long, arduous hikes in which the travelers are at some sort of crossroads, seeking a new direction for their lives from aimlessness or, worse, self-destruction. At first Loose is perplexed by her obsession with these books in which the journeys are always on foot, incredibly difficult, and with a clear finish in sight. She, herself, has no desire to follow in the footsteps of any of the authors she reads, preferring travel that involves a glass of wine and a comfortable bed at the end of each day. Loose maintained her reading binge for nearly four months, finally tossing the last of such books on her donation pile without finishing it. As she emerged "reeling and blinking, bewildered at the world," she knew it was time to make changes of her own. Have you ever gone on a reading binge to grapple with some problem—either one clearly identified or perhaps unconscious? What were the circumstances that led to the binge? How did reading help you address the problem or see it in a new light? Read Loose's essay and submit a 500-word response to this writing prompt by October 3, 2018, for feedback from our editors. Email it to LMreflections (at) literarymama (dot) com and note "September Prompt" in your subject line. Please do not attach the essay but paste the response in the body of the email.